At the close of the Civil War, weary veteran Malcolm Hopeton returns to his home in western New York State to find his wife and hired man missing and his farm in disrepair. A double murder ensues, the repercussions of which ripple through a community with spiritual roots in the Second Great Awakening. Hopeton has gone from the horrors of war to those far worse, and arrayed around him are a host of other people struggling to make sense of his crime. Among them is Enoch Stone, the lawyer for the community, whose spiritual dedication is subverted by his lust for power; August Swarthout, whose wife has left earthly time and whose eye is set on eternity; and a boy who must straddle two worlds as he finds his own truth and strength. Always there is love and the memory of love--as haunting as the American Eden that Jeffrey Lent has so exquisitely rendered in this unforgettable novel. 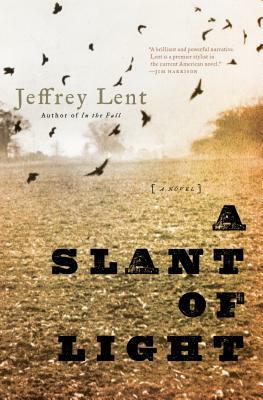 A Slant of Light is a novel of earthly pleasure and deep love, of loss and war, of prophets and followers, of theft and revenge, in an American moment where a seemingly golden age has been shattered. This is Jeffrey Lent on his home ground and at the height of his powers. Jeffrey Lent was born in Vermont and grew up there and in western New York State, on dairy farms. He studied literature and psychology at Franconia College in New Hampshire and SUNY Purchase. His first novel, "In the Fall," was a national bestseller and a "New York Times Book Review" Notable Book for 2000. His other novels are "Lost Nation," "A Peculiar Grace," and "After You've Gone." Lent lives with his wife and two daughters in central Vermont.